I often receive mails from interested customers and 2 days ago there was one from Australia. 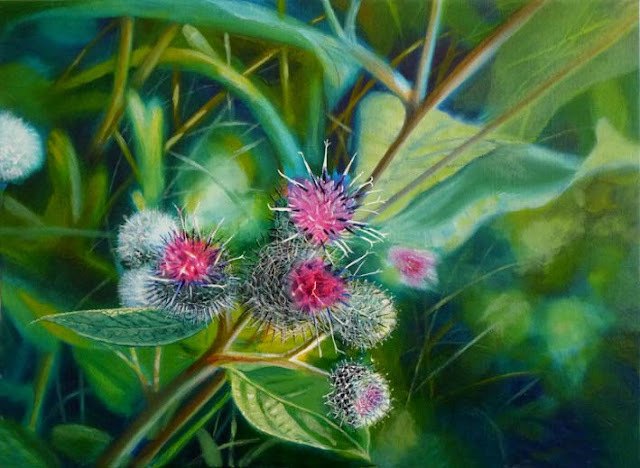 Thanks for the message, I am very happy to know that the piece(Thistle) is still available for sale. i must tell you i am very much interested in the purchase because my wife really love it and she want me to get it home before she deliver our upcoming baby boy lol...I will like to let you know that your payment will be in a Cheque. so that i can proceed in the payment arrangement, consider it sold get back to me asap with needed information. So Mr Gabriel Wolfgang from Adelaide alias Mr Clark Elster from New Jersey and probably many others all use copies of the same mail, they just change the name of the artwork. SO ARTISTS : BE WARNED, ITS A SCAM!!! THEY'RE AFTER BOTH YOUR PAINTINGS AND YOUR MONEY!!!! I get these all the time! Years ago it was the Nigeria scam where a woman was setting up her new apartment in London and just had to have one of my paintings. (I actually corresponded back and forth until I annoyed the person with my questions and they gave up!) It's so exciting when someone emails you about your work, saying they love it, how much a particular piece means to them, or especially when they want to purchase something. Then to discover it's someone who probably did a google image search to find a specific painting. I'm so glad you posted this other artists are aware of the sneaky strategies these scammers use. By the way, I lOVE your work - your watercolors are astonishingly beautiful, your use of washes particularly intrigues me right now. Very inspiring! allowed me to match the frame style with different wallpapers, one of which looked like ours. ELIZABETH TYLER'S E-BOOK "Watercolour in detail"
Now sold in 46 countries! This ebook in PDF format is primarily written for those who have worked with this medium for some time. Here you can find inspiration for a more advanced and different approach in addition to tips and ideas, practical advice and instruction. Coming soon: My new book "Colours of the Sea"
Feedback about my ebook "Watercolour in Detail"
Art blogs targeted by dishonest spammers! I've been a professional artist for over five decades now and my works have been exhibited worldwide in galleries and art museums. The first book I wrote and illustrated about watercolour techniques was published in Denmark in 2005 and my e-book "Watercolour in Detail" on the same subject is now sold in 47 countries. My DVD’s and VODs "Realistic Painting with Acrylics", "Watercolour Realism", "Depth and Detail in watercolour" and "Sailing Through Watercolours" are now produced on license in Australia and distributed worldwide by Pulsar Productions. Apart from painting with acrylics and watercolours my interests are etching, engraving and lithography and last but not least - sailing. I’ve never been any good at knitting. Copyright: Elizabeth Tyler, for all images on this site unless otherwise stated. Simple theme. Powered by Blogger.